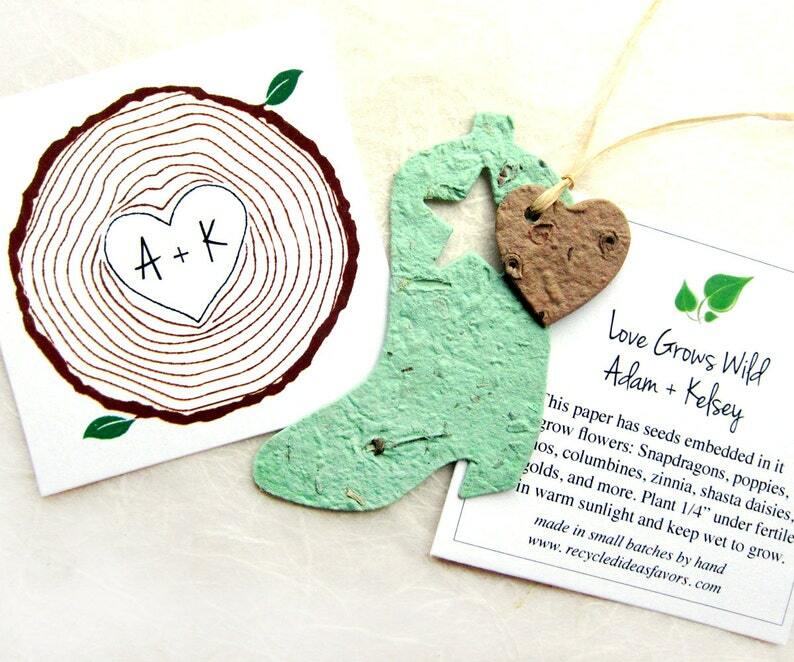 Each handmade plantable paper boot comes loaded with flower seeds embedded right inside the paper. They can be planted to grow! Earth-friendly and budget-friendly too. Use them as wedding favors, table decorations, place cards and more. The imaginative and affordable favors make a memorable gift that can be enjoyed again and again. The photos show some of the available options for cards and also what the boots look like with hearts tied on. Options and costs are available in the drop down menu. COLOR: You decide! We can make the boots any color. You may choose to add printed cards - simple B&W cards with instructions - or one of the color cards shown. The black and white cards are one side only, on regular paper. They can be personalized by leaving a note at checkout for wording (names, date, or thank you message). The color cards are two-sided and have the planting instructions on the back. They are card stock. You can personalize them as shown. Leave a note at checkout with your names, date, initials). Yes, we can do other designs for the cards. Please contact us if you need assistance. ^ Basil, chives, dill, oregano, lavender, parsley and other options! The photos illustrate other ways to display the boots, such as tying a plantable heart to them. Just punch a hole in the heart and tie on through the star opening in the boot. Other colors are available by request, too. We make each batch of boots new and fresh to order, so let us know what type of color you'd like and we'll make them that way! The circles show the colors we regularly make. You can identify the color/s you want by their row and column position. Leave a note at checkout. All paper is made to order to promote freshness. Our handmade seed paper contains a special mix of 'premium' garden flower seeds that is a mix unique to us. Our premium mix contains annuals, for first year color, and also perennials for blooms in the years to follow: Zinnia, pink cosmos, snapdragons, columbine, red and pink poppies, shasta daisies, cornflowers, calendula, dianthus/Sweet Williams, marigolds, black-eyed susans, and other desirable garden flower seeds as available. Cheaper seed paper too often contains low quality 'wildflower' type seeds like baby's breath/sweet alyssum or tiny flowers that grow among grass like dandelions. English daisies are a good example. They sound the same but are nothing like shasta daisies, which are the classic, tall white daises. English daisies are tiny and grow the height of clovers. These are just two differences. We take great care to choose seeds for high quality flowers that are desirable. Planting instructions are included, and we can send you a PDF template so that you can print out more instruction cards on your own. It is free with any order. This item is wonderful! I received it promptly. I appreciate the craftsmanship and the professionalism of our business exchange. These were a fantastic addition to our favour bags to remember our stillborn baby gone too soon. I asked for his name to be put on the instruction cards and this was arranged. They came in lovely colours with good quality selophane bags to seal the butterfly and instructions. Everyone commented on the personal touch. A few recommendations given. Will definitely be using again in November for our anniversary. We accept payment via Paypal and credit card. You will know your order has been accepted when you see a graphic of an empty gift box that says your order is complete. Most US orders ship via USPS First Class or parcel - shipping upgrades to Priority and Express are available for most items. If you have a time sensitive order, such as a pet sympathy card or funeral order, we strongly recommend upgrading to Priority shipping or Express shipping. It is faster and more predictable than First Class and parcel shipping. You are always welcome to upgrade to one of those faster shipping options at checkout. A rush order can almost always be accommodated, but please contact us first to make sure it is possible in the time frame needed. Please note, VAT/duties/customs charges are NOT included in your purchase price. Your purchase may still incur customs charges, levied by your government and payable to them, not to us. We do not charge it. It is your responsibility to ensure that you enter your address correctly when ordering, pay the appropriate tax, where applicable, to your government taxing authority, and to retrieve packages waiting for pick up. Items sent back for failure to pay VAT or that are sent back after not being claimed or for incomplete or incorrect addresses are not eligible for refund. WA state customers will be charged sales tax. Customers from other states will be charged a sales tax if Etsy is required to collect it. When shopping at www.recycledideasfavors.com only WA state buyers are charged a sales tax. How long will the seeded paper last? - Our plantable paper has a shelf life of 12-18+ months and much longer when stored properly away from heat, humidity, and light. To preserve the paper, keep it dry and out of direct sunlight. What type of seeds do you use? - Our seeds are a premium garden flower of both annuals and perennials: Poppies, shasta daisies, calendula, snapdragons, cosmos, zinnia, cornflowers, dianthus/Sweet Williams, columbine, marigolds, lupine, and other garden flower seeds as available. All are relatively easy to sprout from seed and are native to North America. For orders outside the US, we use a slightly different mix of seeds that is appropriate to the area. We do not recommend wildflowers because these are not suitable to plant in all areas and can be too 'weedy' and spread beyond where they are wanted. Do you create custom items? - Yes! We have a set up charge for custom pieces. This cost depends on the type of work needed and is generally $40-250. This is in addition to the cost of the item.